Do Not Add to Cart or Purchase just now! Sleep and Stress management are essential for optimal daily performance, wellbeing and resilience. NeuroSonica(R) Sleep Solutions gives you proven, effective assistance for these - and much more - in one simple, easy to use program. 33% OFF our normal price! for powerful stress management, quality sleep and better health. Powered by our evidence-based SmartSound™ - the world's first ever government regulated Medical therapeutic audio - Sleep Solutions is designed to provide on-demand assistance to help you stay deeply relaxed, refreshed and well slept at work, home or on the move. Sleep Solutions combines three highly effective, multi-functional neuroacoustic sessions to meet your daily needs for sleep and stress management. Totalling nearly two hours, these hi-tech audio sessions produce rapid, tangible results that may become even more effective with regular use. Sleep Solutions also comes with a 'bonus' short, but effective 'Mini-D-Stress' session for quick, convenient assistance. Long term regular use may also encourage beneficial neuroplastic change. SmartSound™ technologies work deep down at the neurological level - where real change takes place. Using Sleep Solutions could not be easier. Simply choose a session, play it through stereo headphones as instructed and let SmartSound™ do the rest. No concentration or other skills are needed - SmartSound™ works automatically by engaging natural neurological, psychological and physiological processes. Sleep Solutions comes with a comprehensive downloadable User Guide (in English) with full instructions for getting the most out of your program including educational information for day to day stress and sleep management, additional ways to use your audio and much more. Using the App you can also access an online version of this Guide that is translatable into many languages. As a regulated medical product, certain legalities including contraindications and age limits apply. You must digitally acknowledge compliance with these prior to purchase. Purchase your Unlock Code below to access the FULL Sleep Solutions App for a whole year at just half the price of a coffee per week! You can download the Sleep Solutions app from the Apple Store or Play Store and use its free Mini-D-Stress session permanently, on EVERY suitable device you own. 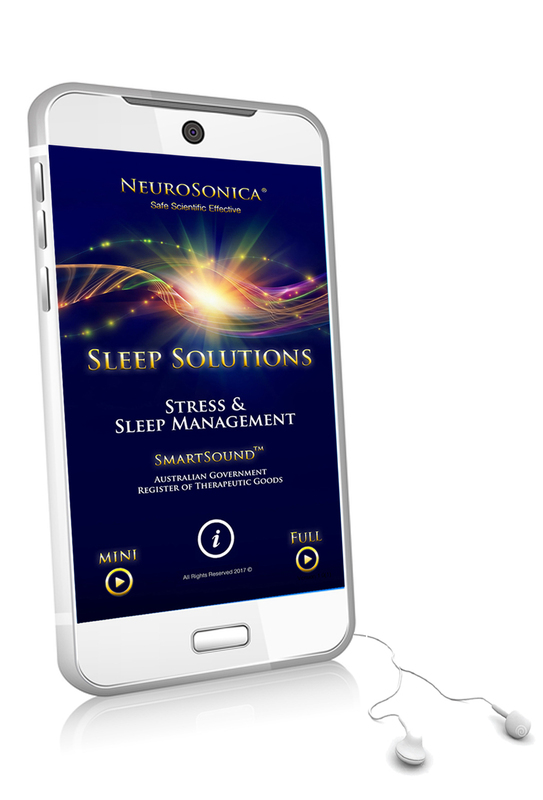 To access the full Sleep Solutions suite you will need to purchase an Unlock Code from NeuroSonica (Add to Cart below), and then enter it into the App. Please remember, your unlocked sessions will only play on ONE dedicated device at a time. However, you can change to another dedicated device at any time. If you purchase today you pay our introductory launch price of just $97 - incredible value for a whole year of stress management and better sleep! Read more / Buy now! General Disclaimer: NeuroSonica SmartSound™ is included in the Australian Government's Register of Therapeutic Goods as a medical device safe for use as instructed. It is not intended to be a substitute for any medical or psychological advice, diagnosis or treatment. Individual results will vary. Contraindications and age restrictions apply. We do not render professional medical, psychological or psychiatric advice in any form whatsoever. All Website and social media content of NeuroSonica, our affiliates or third parties, is for educational purposes only. If you have any medical, psychological or psychiatric conditions, are susceptible to seizures or have any other neurological or neurorespiratory conditions please consult with a licensed medical professional or therapist and use our products only under their supervision. If you experience any unpleasant or unwanted effects discontinue use immediately. The buyer/user agrees that NeuroSonica, its affiliates and/or third parties are in no way liable to you or anyone else for any loss or damage, however caused (and whether direct, indirect, consequential or economic) which may be directly or indirectly suffered in connection with the use of our products, this Website or websites of other entities linked to it. The buyer/user of our products agrees to assume full responsibility thereof and to abide by any and all terms and conditions concerning their use. Use only as instructed - never while under the influence of drugs of any kind, while operating machinery or equipment, driving or any other potentially hazardous activities. This general disclaimer is not restricted or modified by any additional specific warnings or disclaimers.